This is truely one of the most outstanding properties in Indian Camp Estates, a gated community in Rosman, North Carolina. 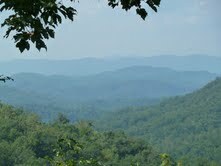 A remarkable 7.73 acres with at least 180 degree extreme long range mountain views from the house site. Very private with a gentle proposed drive to the nearly all level house site. Relax at a cool 3250 foot elevation, enjoy the spectacular views, bask in Mother Nature’s Paradise, and you will appreciate the short distance to South Carolina, Rosman and Brevard. This property has it all! Indian Camp Estates is a gated community featuring camp like properties located in the gated community of Indian Camp Mountain. This community overlooks Lake Jocasse and Lake Keowe and is less than an hour from Greenville, South Carolina and only 2.5 hours to Atlanta, GA. Rosman is a small town just on the outskirts of Brevard, NC and rests on the eastern boundary of Pisgah National Forest.